Little Monsters Contest! Tell Your Story and Win a Prize! The truth is, even if children always behaved like little angels, the bilingual journey would still be a challenging experience for most parents, especially when literacy in the minority language is also an important aim. To foster higher levels of language ability, a significant amount of time, effort, and expense is required and these demands must remain a central part of a family’s lifestyle throughout the years of childhood. All this turns even tougher, though, when a child’s behavior becomes less like a little angel and more like a little devil. If you’ve been following this blog, you know that my 10-year-old daughter has always had a willful streak. Compared to my seven-year-old son, who’s generally quite easygoing and obedient, Lulu is rather high-strung and rebellious. And lately, her behavior has taken a turn for the worse and my wife and I have found ourselves engaged in duels with her over our expectations for her homework and her other responsibilities at home. I honestly don’t think we ask too much of her: our expectations may be high, but they’re not unreasonable, and we simply want her to take on these tasks positively and proactively, without continually dragging her feet and doing less than her best. In one of my recent moments of exasperation, I “grounded” her for the day: she couldn’t leave the house to play with friends or go shopping with her mother. From the tearful outburst that followed, you would have thought I had just given her a life sentence! As she went on wailing in the living room, I took refuge in my little office and opened the desktop file with the journal I’ve kept throughout their childhood. (See Why Keeping a Journal on Your Kids is So Valuable.) Since Lulu has had a long history of erupting in tantrums in times of frustration, I was seeking some of these earlier incidents to help lighten my perspective: if I survived those times, and can now look back at them and laugh, I can survive this time, too. Reading these old journal entries, I not only regained a more healthy perspective, I thought of a fun way, with Halloween approaching, for us all to lighten the load of our journey just a bit: by holding a contest where we share humorous stories of the times our bilingual monkeys turned into little monsters. Let me start with a story of my own. Then I hope you’ll share a story, too, by posting a comment below. Now I know kids love video games—and there can be some language learning benefits with a system in the minority language—but my wife and I have actively limited the amount of video games our children play. Apart from some old CD-ROMs, which they occasionally play on my aging laptop, they have few opportunities to play video games at all. At some point I’m sure we’ll get more electronic devices (like another desktop computer and a tablet), but I’m quite content to emphasize “unwired activities,” particularly reading paper books, for a while longer. Santa, then, was faced with turning down Lulu’s request…but Santa also knew this had to be handled carefully because her hopes were very high. If Lulu woke up on Christmas morning, bubbling with excitement, and didn’t find a Wii under the Christmas tree, she would likely explode in screaming disappointment. That would hardly be a merry Christmas for any of us. So, on Christmas Eve, before lunch, Lulu received a typed reply in the mailbox. In his letter, Santa said that he was sorry, but he wouldn’t be able to deliver the Wii video game console that she had asked for. Her letter had arrived at the North Pole too late, he explained, and a Wii is the sort of toy that takes the elves a while to make. He then went on to try easing her disappointment by saying that he would be giving her some gifts that he was sure she would like and—right then Lulu blew up like a bomb. I couldn’t help it—I had to laugh. 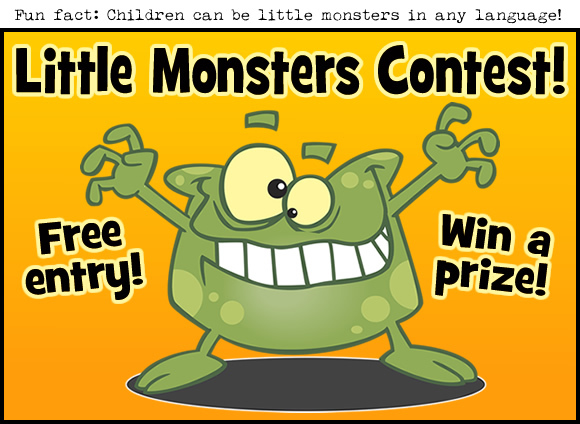 Enter the Little Monsters Contest and win a $20 amazon gift card! The stories of their children turning into little monsters, and the fun stories from other parents, too, can be read below. 1. Entry is open to all subscribers of my free newsletter. 2. Share this post with others via social networking sites. I’m using the “honor system” here, but I’d be really grateful if you shared this post widely on Facebook, Twitter, and other social networking sites before moving on to step 3. I’d love to gather as many fun stories as possible. *Please include your child’s name (or nickname—not just the first letter of a name) and age at the time of the incident. *Be sure to tell the story, from beginning to end, as clearly as you can. The English doesn’t have to be perfect, but it should be easy to read and understand, so do your very best and proofread everything carefully before you submit your entry. 4. All entries must be submitted by midnight on Friday, October 31 (Japan time). The next morning, I’ll print out all the stories and my kids and I will read them and vote on our favorites. The three of us, individually, will give each story a score, from 1 to 5 (5 is the highest), and the three stories that earn the most points will be declared the winners of the contest. 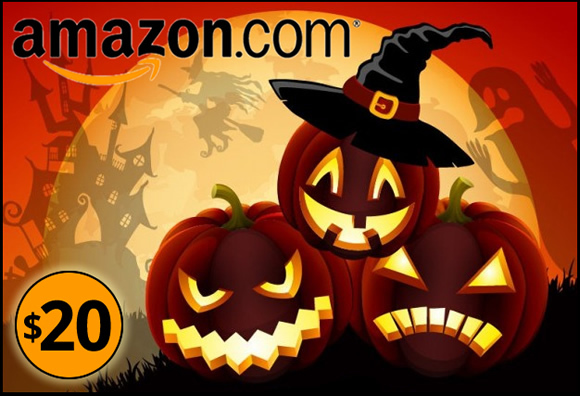 The three winners will then each receive a $20 amazon gift card. At one point I tried explaining that we already have a lot of toys, and we wouldn’t be able to get any new things until we gave up some of the old things. His instant response was a promise to give some of his stuff to other kids so I could buy some new stuff for him. Again, I had to laugh. 3. First, I have to admit that the issue “When you’re dead…” is pretty fine here. We will all become stardust, so don’t worry! About my little monsters, well, they don’t ask me for toys, hopefully, but they really want to be the boss! Once we were at the playground in our little town. We were playing catch me if you can, pushing swings, etc. After one hour I gently asked if we could go home or take a walk. I wanted to get something to eat, at least. Viola, who’s 4, decided that she could spend more time there at the park and then go home by herself “Because I’m five!! !” (She always says she’s 5.) She climbed up to the top of the slide and sat down. Matteo, who’s 2 1/2, started screaming, NOOOOOOOOOOOOOOOOOOOOOO! SWIIIIIIIIIIIIIIIIIIIIIIIIIIIING! NOOOOOOOOOOOOOOOOOOOOOO!” And he started running out the gate of the playground. So I had to split up, but I couldn’t, and it was a very loud and panicky situation. I yelled at Viola to come down immediately and not to move. Then I rushed out and caught Matteo, who was already at the end of the street. I came back to pick up Viola, who was still grumpy but finally obedient. In the end, it was pretty funny. 3. Maeva, four, went through a phase when she was very reluctant to brush her teeth. It did last a good six months and would end up every evening by a massive tantrum. We tried the stickers, reward chart, reading stories about how important it is to brush the teeth. We watched the “once upon a time … life” the mouth and teeth many, many times … I would also overact every time she would comply, telling her what a fantastic smile she had. p.s. We now sorted the brushing the teeth issue by giving her her toothbrush during her screen time (10 min in the morning and 10 minutes in the evening). Results: sparkling teeth every time! Ha! I wish I would have thought about this long ago! 3. The approach of Halloween brings this “costume drama” to mind. I was at a carnival parade with our three kids: a little Laura-clown (aged 3) in the buggy, a 7-year-old Sebastian-cowboy and a 5-year-old Daniel-pirate by my side. At the German “Fasching” (mardi gras) parades, people on the floats throw sweets for the kids, so my boys were having a whale of a time trying to catch them and fill their bags. After the final floats had gone past, the boys figured out that if they ran ahead along the route, they could see the parade again and – more importantly – get even more sweets. They did call out to me saying what they were going to do, but before I could answer they’d darted away. They probably knew I would have said no, and with the buggy to maneuver through the crowds there was no way I could keep up with them. They knew their way around our little town pretty well, but it was full of people because of the parade, and I couldn’t be sure that they’d have the presence of mind to wait at a place where I’d find them, or perhaps make their way home. I just hoped they’d at least stay together. As the event came to an end I started moving along the route, but I couldn’t find them anywhere. I left Laura-clown with a friend so I could get around more quickly and finally found the boys, one after the other in separate places, just as it was dawning on them that they might be lost. It was a nasty ten minutes, but looking back I have to laugh at myself, going round frantically asking people whether they’d seen a cowboy and a pirate when half the kids at the parade were dressed that way. Tomorrow Halloween parade downtown. Wish me good luck!!! Well… I guess I didn’t say it had to have a happy ending! That’s really funny – I love it how kids surprise us by coming up with their own spin on things. 3. We live in France, where until this past school year, there was no school on Wednesdays for preschool and elementary school children. My daughter Flora who was in her first preschool year, didn’t like Wednesdays when there was no preschool but daycare. So every Wednesday morning she would act up and refuse to go. In February, when she was three-and-a-half, there was one week when she acted up every single day. On Monday, a school day, on Tuesday, a school day, on Wednesday, a daycare day. But none of those days had prepared me for Thursday. And this was February in France, so she also had to wear tights. And shoes of course. And a coat. By the time she was dressed, it was too late to have breakfast. Why, you ask? Because French schools lock their doors so no-one who has no business there can come in (and kidnap the children from their classrooms). But that means that late-coming parents will also stand outside the locked doors and have to take their children to the office with them. The only upside (for me) was that she was screaming in German, so at least no one would understand her. I left to go to the office (alone! ), wondering what the teacher thought had happened. I still wonder that today. I feel a bit guilty to admit it, but when I see a parent struggling with a recalcitrant child in public (especially on the way to preschool), I find myself thinking “good to see it’s not just me”. I took her to the swimming pool on Friday evening, since swim school takes a break during the school holidays, and the pool excursion with daycare the previous week confined all twenty kids to the 10cm deep play pool. Which is not fun when you can swim and dive. But then it was time to leave. I’d given her 15 minutes advance notice – the sort of 15 minutes that eventually turn into 30 minutes. But as soon as we left the water she started wailing like a siren. (The sirens of Antiquity, not the fire sirens.) It lasted all through showering, getting our stuff from the lockers, finding a changing cabin, getting all the stuff (including bike helmets and accessories from her Halloween celebration that day at daycare) into the cabin, and getting her dried and dressed (and myself too). The theme was “I don’t want to go home” alternating with “I don’t want to leave”, with a variation of “I want to go back upstairs” (the changing rooms are downstairs from the pool). Fortunately, and contrary to the events described in my dry land little monster story, there wasn’t too much physical resistance, and eventually I got her into her clothes. When we left the cabins, the wailing stopped and I could dry her hair and strap her into the bike seat to go home. Needless to say, we won’t be doing that again any time soon. Even though all the wailing was in German.